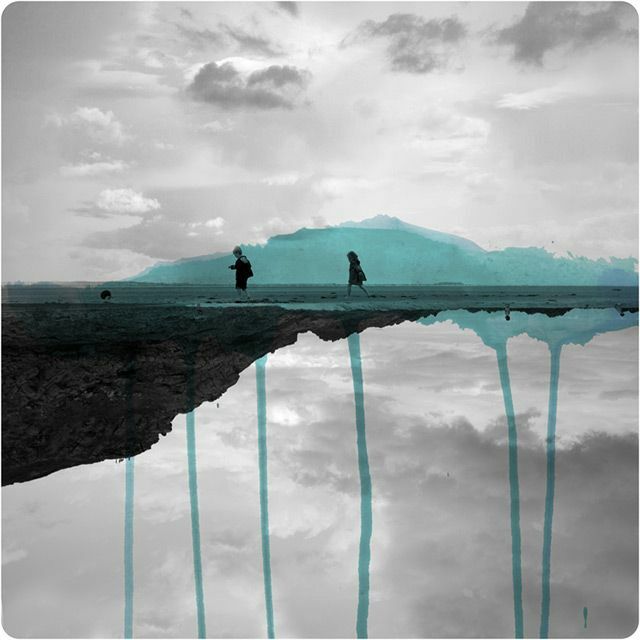 Fabienne Rivory is a French artist who is making artwork that blends paint and photography since 2007. She loves to explore interactions between photography and painting, real world and imagination, memories and reality. Her paintings of the series ‘Miroir’ are made of watercolor or inks that are then digitally combined with photos. The finished works contain a certain vibrancy and mediate a more subjective and poetic vision. Lastly, I love the contrast in colors. The blue adds a very soothing tone, but the stark black and white behind it with only slight definition in the storm clouds as a strong, quarreling, almost raging sensation. The storm and the calm as it were. Isn’t it just, I look at it daily. It has me mesmerised. Some day hopefully I will have this print hanging in my living room.